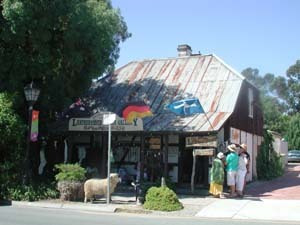 Hahndorf is the oldest surviving German Village in Australia and is a popular tourist destination. Many of the original buildings and traditions have been retained and Hahndorf's village atmosphere is complimented by a myriad of cafes and speciality shops. There are hotels, restaurants, galleries, artisans at work, gourmet food outlets and a wide selection of accommodation. Several wineries showcase the best of Adelaide Hills' wines a short drive from Hahndorf. The Hahndorf township is just 20 minutes from the city along the South Eastern Freeway. Hahndorf is a short drive from Mount Barker, the Adelaide Hills' main shopping and business hub. Authentic German food is served in Hahndorf, as well as modern Australian and European cuisine, country style cooking, great coffee and delectable cakes. German sausage and smallgoods are available. There are also Icecream and sweet shops for the young and young at heart. 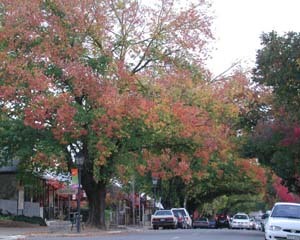 The traders of Hahndorf originate from many parts of the world and have introduced new flavours in the tree-lined main avenue. There are a number of quality galleries with gift shopping to rival the best in Adelaide. 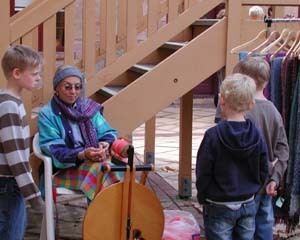 Several craftspeople manufacture and showcase their unique wares in Hahndorf. Souvenirs can be readily purchased and some great fashion shops will please the ladies. The trees along the street are over 100 years old and are an attraction. 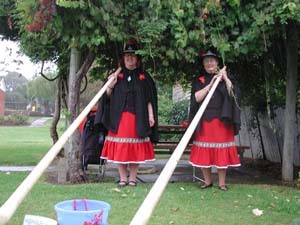 A guide to them can be obtained from the Tourist Centre in the main street. The picturesque village is ideally situated as a base for exploring and visiting the wine areas of the Adelaide Hills, the Barossa and McLaren Vale. Hahndorf accommodation includes romantic bed and breakfast establishments, motel suites and chalets for couples and family accommodation. The founding of Hahndorf is a colourful piece of South Australian history. German immigrants, escaping religious persecution from Prussia arrived in the ship Zebra and established the village. It was named Hahndorf in honour of Captain Hahn, the ship’s captain. He had been sympathetic and had assisted them to become established in Hahndorf. Many of the quaint cottages are accessible in the main street, most in original condition except for iron roofs, that have replaced shingles and thatch. In some cottages, the shingles may be seen underneath. Historic Hahndorf Academy was a respected school of higher learning, where many students became prominent citizens. The building was later used as a seminary, then a hospital. It was doomed to be demolished until rescued by Mr Wotzke. The Academy is now a gallery with exhibitions and artists in residence. There is also a fine German Folk Museum depicting early days of Hahndorf. The Pioneer Memorial Gardens in Hahndorf's main street were established to mark the centenary of Hahndorf. The names of the first fifty-two families to settle in the area are inscribed on the Memorial Gates. Many of the descendants still live in the district. Hahndorf is surrounded by meadows and some majestic gum trees can be seen, a favourite subject of South Australia’s legendary artist Sir Hans Heysen. He lived and entertained at the The Cedars, his property on the outskirts of Hahndorf. His Bavarian style studio remains much as he left it. Heysen’s love of the stately gum trees shows in his works and his depiction of workmen and country life around Hahndorf have immortalised the scenes. 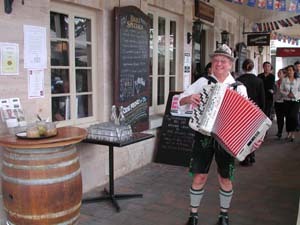 The overall ambience of Hahndorf may best be described by a German word for which there is no translation - Gemutlichkeit! !